Load Fido in the car, drive out to the country, and meet me at the Christmas tree farm for limited edition holiday sessions! It's the perfect natural backdrop for holiday photos, and you'll be one step closer to having your Christmas cards in the mail. Reserve your spot using the link below. 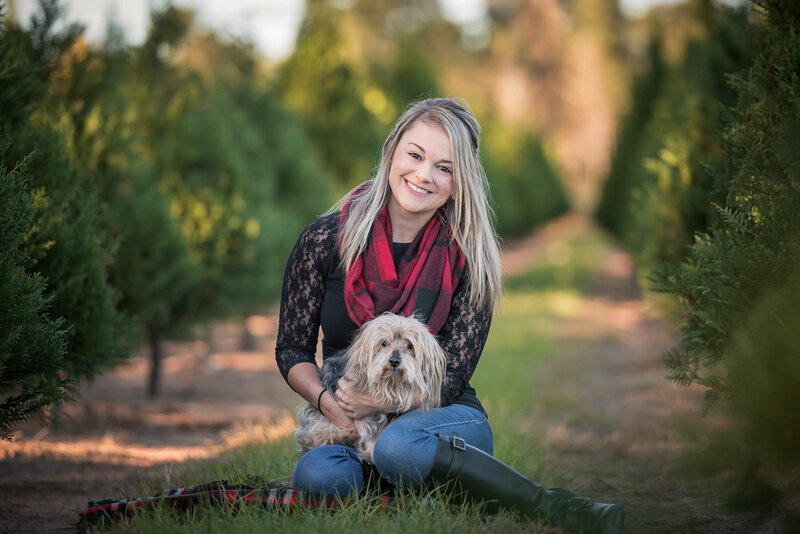 Enjoy a festive 15-minute photo session at the tree farm. Meet me at my home to view the proofs, choose favorites, and place your order. Decorate your home and mail your holiday cards to friends and family! Your holiday session includes two 8x10 desk prints with the matching high-resolution digital files. Additional print and digital products may be purchased separately. Don't worry! Special training is not required to achieve great images. In fact, nearly all the dogs on my website are regular family pets who were photographed with their leashes on. Can you photograph me and my dog together? Yes, these holiday sessions are all about family! Each session can accommodate up to four subjects (human or canine) from the same household. For larger families, please contact me about booking a full session. When will my photographs/products be ready? Within 2 weeks of your session, we’ll meet again to view proofs and select your favorites. Final digital images, holiday cards, and other printed products should be ready by the end of November. Do you offer holiday cards or other printed products? Yes, I specialize in creating custom printed artwork! I'm happy to take care of your holiday cards or help you create a finished wall portrait or desk display - just ask! These holiday sessions will take place outdoors at a Christmas tree farm near Tomball, TX (about 40 miles from downtown Houston). Dogs must be on leash at the farm. Will you have a lot of props? The Christmas trees provide a beautiful and natural backdrop. There will not be an elaborate “set”, but you are welcome to bring holiday-themed props (e.g. Santa hats) if you’d like. See next question about wardrobe. Rustic holiday attire looks fabulous at the tree farm. Think jeans, boots, sweaters, plaid, scarves, and pops of red. I can help you choose the perfect wardrobe. And just a simple collar is all your dog needs! I can't make it on November 2nd. Are other dates available? Not at this time. If this event sells out, there is a slight possibility I will open one more date (no promises!) If you would like to be the first to know about future events, be sure to enter your email in the form below. Subscribers get priority booking for all limited edition sessions, fundraising sessions, and model calls. Can't attend this one, but want to participate next time? Enter your email below to be the first to know about future events!